Sales force needs high accuracy attending customers in their needs and desires. But some customers desires can be harmful for the business. Under this game a relation gain-gain is the only one acceptable way. If you attend a customer with high sales velocity and effectiveness, eventual failures will appear much more than in companies where the level of service is below average. For other side, Managers sometimes are more interested in their short term goals than in taking the better decisions for the company and shareholders. In a great global group where I worked during several years in beggining of December the volume of sales in some years were far from company target. So, in order to close the targets and putting the Bonus in the pocket, the company was used to give huge discounts and very long term of payments to a few of powerful customers. With this strategy company obtained a lot of orders and invoiced the amount needed to close the targets. Managers reached their targest, but the company had their products level of sales in market negatively affected and also that policy caused losses in working capital. This is a kind of harmful decision that a feel but powerfull persons group can take prejudicing the shareholders and company interest. In the coming year in the first quarter the sales were too small because of huge amount of goods pushed to customers. 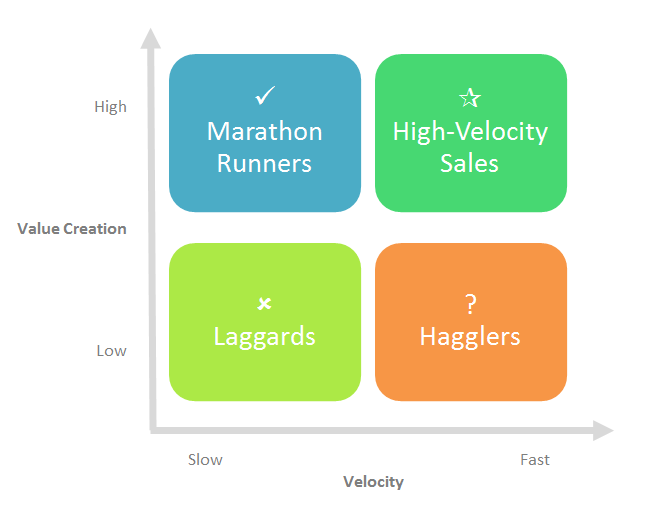 So, intelligent and fair Sales Strategy is that one that generates velocity in sales flow since obtain the order until to be sold in final consumer.The figure below ilustrates the high velocity sales model. 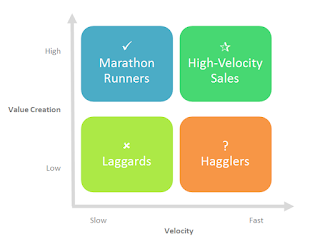 There are four distinct type of sales persons – They are Laggards, Hagglers, Marathon Runners, and High Value Accelerated Sellers. Sales Force Effectiveness should not be submitted to one or another interest, but unfortunatelly some managers remain taking wrong decisions and the company Boards do not discover their destrutive management. The alternative for this maybe could a high level Management Competence Audit provided for high qualified third parties. Below please a find a chart self explainatory showing approaches that contributes for Sales Force development. For effectiness the Companies should be focused in External and Internal forces. The equilibrium, velocity and professional management of all factors is mandatory. Under this never the interest of a group of powerfull managers in order protect their Bonus can be excuses for destructve and dummy decisions.